The imaging method called cryo-electron microscopy (cryo-EM) allows researchers to visualize the shapes of biological molecules with an unprecedented level of detail. 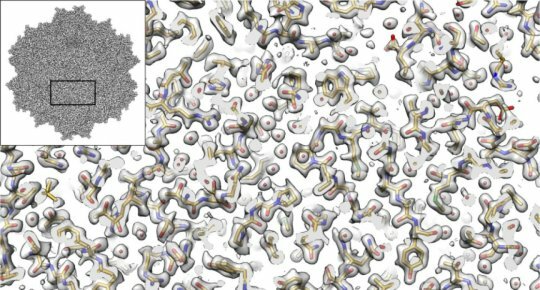 Now, a team led by researchers from the Salk Institute and the University of Florida is reporting how they used cryo-EM to show the structure of a version of a virus called an AAV2, advancing the technique’s capabilities and the virus’ potential as a delivery vehicle for gene therapies. The investigators used several technical advances to create a three-dimensional representation of an AAV2 (short for adeno-associated virus serotype 2) variant, with much better resolution than what has ever been accomplished before. The study, which was reported in Nature Communications on September 7, 2018, is advancing methodological applications of cryo-EM while also helping to develop better gene therapies, including treatments for some inherited types of blindness, hemophilia and diseases of the nervous system. Cryo-EM has allowed investigators to peer into the inner workings of tiny structures, and is changing our understanding of biomolecules and their mechanisms. In the current work, the authors show that the technique is truly capable of reaching resolutions almost down to the level of the single atom. It also enables researchers to derive structures for entire protein complexes, rather than just portions of proteins. In the new study, the Salk investigators focused on a version of an AAV2 virus that has a particular change in one of its amino acids. This version is interesting because it’s less infectious than some other AAVs, and is being studied for its important implications in the viral life cycle. The new research provided a structural explanation for why it’s different from other viruses, by revealing key changes in the viral portal used to package DNA. Such studies will inform gene therapy applications in which a corrective gene for a disease is carried inside a virus, which delivers the gene to a cell. Gene therapy is being studied for a number of diseases caused by single mutations, including Leber congenital amaurosis, Duchenne muscular dystrophy, sickle-cell anemia, junctional epidermolysis bullosa and hemophilia, among others. Lyumkis says that the data generation techniques illustrated in this study show that it’s possible to extrapolate findings with lower-voltage microscopes than required previously. In the future, this will enable researchers to use new versions of cryo-EM instruments that cost less. “Cryo-EM microscopes are very expensive, and not many institutions have them right now. These findings will help open up this field to almost any academic institution doing structural biology research,” he notes.